The global natural gas trade in 2013. Numbers are in billion cubic meters per year. Natural gas extraction by countries in cubic meters per year around 2013. Natural gas is a fossil fuel used as a source of energy for heating, cooking, and electricity generation. It is also used as a fuel for vehicles and as a chemical feedstock in the manufacture of plastics and other commercially important organic chemicals. Fossil fuel based natural gas is a non-renewable resource. Natural gas is found in deep underground rock formations or associated with other hydrocarbon reservoirs in coal beds and as methane clathrates. Petroleum is another resource and fossil fuel found in close proximity to and with natural gas. Most natural gas was created over time by two mechanisms: biogenic and thermogenic. Biogenic gas is created by methanogenic organisms in marshes, bogs, landfills, and shallow sediments. Deeper in the earth, at greater temperature and pressure, thermogenic gas is created from buried organic material. In petroleum production gas is often burnt as flare gas. The World Bank estimates that over 150 cubic kilometers of natural gas are flared or vented annually. Before natural gas can be used as a fuel, most, but not all, must be processed to remove impurities, including water, to meet the specifications of marketable natural gas. The by-products of this processing include: ethane, propane, butanes, pentanes, and higher molecular weight hydrocarbons, hydrogen sulfide (which may be converted into pure sulfur), carbon dioxide, water vapor, and sometimes helium and nitrogen. Natural gas is often informally referred to simply as "gas", especially when compared to other energy sources such as oil or coal. However, it is not to be confused with gasoline, especially in North America, where the term gasoline is often shortened in colloquial usage to gas. Natural gas was discovered accidentally in ancient China, as it resulted from the drilling for brines. Natural gas was first used by the Chinese in about 500 BC (possibly even 1000 BC). They discovered a way to transport gas seeping from the ground in crude pipelines of bamboo to where it was used to boil salt water to extract the salt, in the Ziliujing District of Sichuan. The world's first industrial extraction of natural gas started at Fredonia, New York, United States, in 1825. By 2009, 66 000 km³ (or 8%) had been used out of the total 850 000 km³ of estimated remaining recoverable reserves of natural gas. Based on an estimated 2015 world consumption rate of about 3400 km³ of gas per year, the total estimated remaining economically recoverable reserves of natural gas would last 250 years at current consumption rates. An annual increase in usage of 2–3% could result in currently recoverable reserves lasting significantly less, perhaps as few as 80 to 100 years. Natural gas drilling rig in Texas. In the 19th century, natural gas was usually obtained as a by-product of producing oil, since the small, light gas carbon chains came out of solution as the extracted fluids underwent pressure reduction from the reservoir to the surface, similar to uncapping a soft drink bottle where the carbon dioxide effervesces. Unwanted natural gas was a disposal problem in the active oil fields. If there was not a market for natural gas near the wellhead it was prohibitively expensive to pipe to the end user. In the 19th century and early 20th century, unwanted gas was usually burned off at oil fields. Today, unwanted gas (or stranded gas without a market) associated with oil extraction often is returned to the reservoir with 'injection' wells while awaiting a possible future market or to repressurize the formation, which can enhance extraction rates from other wells. In regions with a high natural gas demand (such as the US), pipelines are constructed when it is economically feasible to transport gas from a wellsite to an end consumer. In addition to transporting gas via pipelines for use in power generation, other end uses for natural gas include export as liquefied natural gas (LNG) or conversion of natural gas into other liquid products via gas to liquids (GTL) technologies. GTL technologies can convert natural gas into liquids products such as gasoline, diesel or jet fuel. A variety of GTL technologies have been developed, including Fischer–Tropsch (F–T), methanol to gasoline (MTG) and syngas to gasoline plus (STG+). F–T produces a synthetic crude that can be further refined into finished products, while MTG can produce synthetic gasoline from natural gas. STG+ can produce drop-in gasoline, diesel, jet fuel and aromatic chemicals directly from natural gas via a single-loop process. In 2011, Royal Dutch Shell's 140,000 barrels (22,000 m3) per day F–T plant went into operation in Qatar. Natural gas extracted from oil wells is called casinghead gas (whether or not truly produced up the annulus and through a casinghead outlet) or associated gas. The natural gas industry is extracting an increasing quantity of gas from challenging resource types: sour gas, tight gas, shale gas, and coalbed methane. There is some disagreement on which country has the largest proven gas reserves. Sources that consider that Russia has by far the largest proven reserves include the US CIA (47 600 km³), the US Energy Information Administration (47 800 km³), and OPEC (48 700 km³). However, BP credits Russia with only 32 900 km³, which would place it in second place, slightly behind Iran (33 100 to 33 800 km³, depending on the source). With Gazprom, Russia is frequently the world's largest natural gas extractor. Major proven resources (in cubic kilometers) are world 187 300 (2013), Iran 33 600 (2013), Russia 32 900 (2013), Qatar 25 100 (2013), Turkmenistan 17 500 (2013) and the United States 8500 (2013). It is estimated that there are about 900 000 km³ of "unconventional" gas such as shale gas, of which 180 000 km³ may be recoverable. In turn, many studies from MIT, Black & Veatch and the DOE predict that natural gas will account for a larger portion of electricity generation and heat in the future. The world's largest gas field is the offshore South Pars / North Dome Gas-Condensate field, shared between Iran and Qatar. It is estimated to have 51,000 cubic kilometers (12,000 cu mi) of natural gas and 50 billion barrels (7.9 billion cubic meters) of natural gas condensates. Because natural gas is not a pure product, as the reservoir pressure drops when non-associated gas is extracted from a field under supercritical (pressure/temperature) conditions, the higher molecular weight components may partially condense upon isothermic depressurizing—an effect called retrograde condensation. The liquid thus formed may get trapped as the pores of the gas reservoir get depleted. One method to deal with this problem is to re-inject dried gas free of condensate to maintain the underground pressure and to allow re-evaporation and extraction of condensates. More frequently, the liquid condenses at the surface, and one of the tasks of the gas plant is to collect this condensate. The resulting liquid is called natural gas liquid (NGL) and has commercial value. Shale gas is natural gas produced from shale. Because shale has matrix permeability too low to allow gas to flow in economical quantities, shale gas wells depend on fractures to allow the gas to flow. Early shale gas wells depended on natural fractures through which gas flowed; almost all shale gas wells today require fractures artificially created by hydraulic fracturing. Since 2000, shale gas has become a major source of natural gas in the United States and Canada. Because of increased shale gas production, the United States is now the number one natural gas producer in the world. Following the success in the United States, shale gas exploration is beginning in countries such as Poland, China, and South Africa. Most town "gashouses" located in the eastern US in the late 19th and early 20th centuries were simple by-product coke ovens that heated bituminous coal in air-tight chambers. The gas driven off from the coal was collected and distributed through networks of pipes to residences and other buildings where it was used for cooking and lighting. (Gas heating did not come into widespread use until the last half of the 20th century.) The coal tar (or asphalt) that collected in the bottoms of the gashouse ovens was often used for roofing and other waterproofing purposes, and when mixed with sand and gravel was used for paving streets. Methanogenic archaea are responsible for all biological sources of methane. Some live in symbiotic relationships with other life forms, including termites, ruminants, and cultivated crops. Other sources of methane, the principal component of natural gas, include landfill gas, biogas, and methane hydrate. When methane-rich gases are produced by the anaerobic decay of non-fossil organic matter (biomass), these are referred to as biogas (or natural biogas). Sources of biogas include swamps, marshes, and landfills, as well as agricultural waste materials such as sewage sludge and manure by way of anaerobic digesters, in addition to enteric fermentation, particularly in cattle. Landfill gas is created by decomposition of waste in landfill sites. Excluding water vapor, about half of landfill gas is methane and most of the rest is carbon dioxide, with small amounts of nitrogen, oxygen, and hydrogen, and variable trace amounts of hydrogen sulfide and siloxanes. If the gas is not removed, the pressure may get so high that it works its way to the surface, causing damage to the landfill structure, unpleasant odor, vegetation die-off, and an explosion hazard. The gas can be vented to the atmosphere, flared or burned to produce electricity or heat. Biogas can also be produced by separating organic materials from waste that otherwise goes to landfills. This method is more efficient than just capturing the landfill gas it produces. Anaerobic lagoons produce biogas from manure, while biogas reactors can be used for manure or plant parts. Like landfill gas, biogas is mostly methane and carbon dioxide, with small amounts of nitrogen, oxygen and hydrogen. However, with the exception of pesticides, there are usually lower levels of contaminants. 2 will lower the energy level of the gas below requirements for the pipeline. Siloxanes in the gas will form deposits in gas burners and need to be removed prior to entry into any gas distribution or transmission system. Consequently, it may be more economical to burn the gas on site or within a short distance of the landfill using a dedicated pipeline. Water vapor is often removed, even if the gas is burned on site. If low temperatures condense water out of the gas, siloxanes can be lowered as well because they tend to condense out with the water vapor. Other non-methane components may also be removed to meet emission standards, to prevent fouling of the equipment or for environmental considerations. Co-firing landfill gas with natural gas improves combustion, which lowers emissions. Biogas, and especially landfill gas, are already used in some areas, but their use could be greatly expanded. Experimental systems were being proposed for use in parts of Hertfordshire, UK, and Lyon in France. Using materials that would otherwise generate no income, or even cost money to get rid of, improves the profitability and energy balance of biogas production. Gas generated in sewage treatment plants is commonly used to generate electricity. For example, the Hyperion sewage plant in Los Angeles burns 8 million cubic feet (230,000 cubic meters) of gas per day to generate power New York City utilizes gas to run equipment in the sewage plants, to generate electricity, and in boilers. Using sewage gas to make electricity is not limited to large cities. The city of Bakersfield, California, uses cogeneration at its sewer plants. California has 242 sewage wastewater treatment plants, 74 of which have installed anaerobic digesters. The total biopower generation from the 74 plants is about 66 MW. Huge quantities of natural gas (primarily methane) exist in the form of hydrates under sediment on offshore continental shelves and on land in arctic regions that experience permafrost, such as those in Siberia. Hydrates require a combination of high pressure and low temperature to form. The McMahon natural gas processing plant in Taylor, British Columbia, Canada. Natural gas production in the US reached a peak in 1973, and went over a second lower peak in 2001, but recently has peaked again and is continuing to rise. Because of its low density, it is not easy to store natural gas or to transport it by vehicle. Natural gas pipelines are impractical across oceans, since the gas needs to be cooled down and compressed, as the friction in the pipeline causes the gas to heat up. Many existing pipelines in America are close to reaching their capacity, prompting some politicians representing northern states to speak of potential shortages. The large trade cost implies that natural gas markets are globally much less integrated, causing significant price differences across countries. In Western Europe, the gas pipeline network is already dense. New pipelines are planned or under construction in Eastern Europe and between gas fields in Russia, Near East and Northern Africa and Western Europe. See also List of natural gas pipelines. 2O. Usually sales quality gas that has been treated to remove contamination is traded on a "dry gas" basis and is required to be commercially free from objectionable odours, materials, and dust or other solid or liquid matter, waxes, gums and gum forming constituents, which might damage or adversely affect operation of equipment downstream of the custody transfer point. LNG carriers transport liquefied natural gas (LNG) across oceans, while tank trucks can carry liquefied or compressed natural gas (CNG) over shorter distances. Sea transport using CNG carrier ships that are now under development may be competitive with LNG transport in specific conditions. Gas is turned into liquid at a liquefaction plant, and is returned to gas form at regasification plant at the terminal. Shipborne regasification equipment is also used. LNG is the preferred form for long distance, high volume transportation of natural gas, whereas pipeline is preferred for transport for distances up to 4,000 km (2,500 mi) over land and approximately half that distance offshore. CNG is transported at high pressure, typically above 200 bars (20,000 kPa; 2,900 psi). Compressors and decompression equipment are less capital intensive and may be economical in smaller unit sizes than liquefaction/regasification plants. Natural gas trucks and carriers may transport natural gas directly to end-users, or to distribution points such as pipelines. In the past, the natural gas which was recovered in the course of recovering petroleum could not be profitably sold, and was simply burned at the oil field in a process known as flaring. Flaring is now illegal in many countries. Additionally, higher demand in the last 20–30 years has made production of gas associated with oil economically viable. As a further option, the gas is now sometimes re-injected into the formation for enhanced oil recovery by pressure maintenance as well as miscible or immiscible flooding. Conservation, re-injection, or flaring of natural gas associated with oil is primarily dependent on proximity to markets (pipelines), and regulatory restrictions. Natural gas can be indirectly exported through the absorption in other physical output. A recent study suggests that the expansion of shale gas production in the US has caused prices to drop relative to other countries. This has caused a boom in energy intensive manufacturing sector exports, whereby the average dollar unit of US manufacturing exports has almost tripled its energy content between 1996 and 2012. A "master gas system" was invented in Saudi Arabia in the late 1970s, ending any necessity for flaring. Satellite observation, however, shows that flaring and venting are still practiced in some gas-extracting countries. Natural gas is used to generate electricity and heat for desalination. Similarly, some landfills that also discharge methane gases have been set up to capture the methane and generate electricity. Natural gas is often stored underground inside depleted gas reservoirs from previous gas wells, salt domes, or in tanks as liquefied natural gas. The gas is injected in a time of low demand and extracted when demand picks up. Storage nearby end users helps to meet volatile demands, but such storage may not always be practicable. With 15 countries accounting for 84% of the worldwide extraction, access to natural gas has become an important issue in international politics, and countries vie for control of pipelines. In the first decade of the 21st century, Gazprom, the state-owned energy company in Russia, engaged in disputes with Ukraine and Belarus over the price of natural gas, which have created concerns that gas deliveries to parts of Europe could be cut off for political reasons. The United States is preparing to export natural gas. Many gas and oil companies are considering the economic and environmental benefits of floating liquefied natural gas (FLNG). There are currently projects underway to construct five FLNG facilities. Petronas is close to completion on their FLNG-1 at Daewoo Shipbuilding and Marine Engineering and are underway on their FLNG-2 project at Samsung Heavy Industries. Shell Prelude is due to start production 2017. The Browse LNG project will commence FEED in 2019. 4). The natural gas transmission lines extend to the natural gas processing plant or unit which removes the higher molecular weighted hydrocarbons to produce natural gas with energy content between 950–1,050 British thermal units per cubic foot (35–39 MJ/m3). The processed natural gas may then be used for residential, commercial and industrial uses. Coal-fired electric power generation emits around 2,000 pounds (900 kg) of carbon dioxide for every megawatt-hour (MWh) generated, which is almost double the carbon dioxide released by natural gas-fired generation. Because of this higher carbon efficiency of natural gas generation, as the fuel mix in the United States has changed to reduce coal and increase natural gas generation, carbon dioxide emissions have unexpectedly fallen. Those measured in the first quarter of 2012 were the lowest of any recorded for the first quarter of any year since 1992. Combined cycle power generation using natural gas is currently the cleanest available source of power using hydrocarbon fuels, and this technology is widely and increasingly used as natural gas can be obtained at increasingly reasonable costs. Fuel cell technology may eventually provide cleaner options for converting natural gas into electricity, but as yet it is not price-competitive. Locally produced electricity and heat using natural gas powered Combined Heat and Power plant (CHP or Cogeneration plant) is considered energy efficient and a rapid way to cut carbon emissions. Natural gas generated power has increased from 740 TWh in 1973 to 5140 TWh in 2014, generating 22% of the worlds total electricity. Approximately half as much as generated with coal. Efforts around the world to reduce the use of coal has led some regions to switch to natural gas. Natural gas dispensed in a residential setting can generate temperatures in excess of 1,100 °C (2,000 °F) making it a powerful domestic cooking and heating fuel. In much of the developed world it is supplied through pipes to homes, where it is used for many purposes including ranges and ovens, gas-heated clothes dryers, heating/cooling, and central heating. Heaters in homes and other buildings may include boilers, furnaces, and water heaters. Both North America and Europe are major consumers of natural gas. Domestic appliances, furnaces, and boilers use low pressure, usually 6 to 7 inches of water (6" to 7" WC), which is about 0.25 psig. The pressures in the supply lines vary, either utilization pressure (UP, the aforementioned 6" to 7" WC) or elevated pressure (EP), which may be anywhere from 1 psig to 120 psig. Systems using EP have a regulator at the service entrance to step down the pressure to UP. In the US compressed natural gas (CNG) is used in rural homes without connections to piped-in public utility services, or with portable grills. Natural gas is also supplied by independent natural gas suppliers through Natural Gas Choice programs throughout the United States. However, as CNG costs more than LPG (liquefied petroleum gas), LPG is the dominant source of rural gas. A Washington, D.C. Metrobus, which runs on natural gas. CNG is a cleaner and also cheaper alternative to other automobile fuels such as gasoline (petrol) and diesel. By the end of 2014 there were over 20 million natural gas vehicles worldwide, led by Iran (3.5 million), China (3.3 million), Pakistan (2.8 million), Argentina (2.5 million), India (1.8 million), and Brazil (1.8 million). The energy efficiency is generally equal to that of gasoline engines, but lower compared with modern diesel engines. Gasoline/petrol vehicles converted to run on natural gas suffer because of the low compression ratio of their engines, resulting in a cropping of delivered power while running on natural gas (10%–15%). CNG-specific engines, however, use a higher compression ratio due to this fuel's higher octane number of 120–130. LNG is also being used in aircraft. Russian aircraft manufacturer Tupolev for instance is running a development program to produce LNG- and hydrogen-powered aircraft. The program has been running since the mid-1970s, and seeks to develop LNG and hydrogen variants of the Tu-204 and Tu-334 passenger aircraft, and also the Tu-330 cargo aircraft. Depending on the current market price for jet fuel and LNG, fuel for an LNG-powered aircraft could cost 5,000 rubles (US$100) less per tonne, roughly 60%, with considerable reductions to carbon monoxide, hydrocarbon and nitrogen oxide emissions. Natural gas can be used to produce hydrogen, with one common method being the hydrogen reformer. Hydrogen has many applications: it is a primary feedstock for the chemical industry, a hydrogenating agent, an important commodity for oil refineries, and the fuel source in hydrogen vehicles. Protein rich animal and fish feed is produced by feeding natural gas to Methylococcus capsulatus bacteria on commercial scale. 2O. While the lifetime of atmospheric methane is relatively short when compared to carbon dioxide, with a half-life of about 7 years, it is more efficient at trapping heat in the atmosphere, so that a given quantity of methane has 84 times the global-warming potential of carbon dioxide over a 20-year period and 28 times over a 100-year period. Natural gas is thus a more potent greenhouse gas than carbon dioxide due to the greater global-warming potential of methane. 2009 estimates by the EPA place global emissions of methane at 85 cubic kilometers (3.0 trillion cubic feet) annually, or 3% of global production, 3.0 trillion cubic meters or 105 trillion cubic feet (2009 est). Direct emissions of methane represented 14.3% by volume of all global anthropogenic greenhouse gas emissions in 2004. 2 emissions, while coal and oil produced 10.6 and 10.2 billion tons respectively. According to an updated version of the Special Report on Emissions Scenario by 2030, natural gas would be the source of 11 billion tons a year, with coal and oil now 8.4 and 17.2 billion respectively because demand is increasing 1.9% a year. 2S). This untreated gas is toxic. Amine gas treating, an industrial scale process which removes acidic gaseous components, is often used to remove hydrogen sulfide from natural gas. Extraction of natural gas (or oil) leads to decrease in pressure in the reservoir. Such decrease in pressure in turn may result in subsidence, sinking of the ground above. Subsidence may affect ecosystems, waterways, sewer and water supply systems, foundations, and so on. Releasing natural gas from subsurface porous rock formations may be accomplished by a process called hydraulic fracturing or "fracking". It's estimated that hydraulic fracturing will eventually account for nearly 70% of natural gas development in North America. Since the first commercial hydraulic fracturing operation in 1949, approximately one million wells have been hydraulically fractured in the United States. The production of natural gas from hydraulically fractured wells has utilized the technological developments of directional and horizontal drilling, which improved access to natural gas in tight rock formations. Strong growth in the production of unconventional gas from hydraulically fractured wells occurred between 2000-2012. In hydraulic fracturing, well operators force water mixed with a variety of chemicals through the wellbore casing into the rock. The high pressure water breaks up or "fracks" the rock, which releases gas from the rock formation. Sand and other particles are added to the water as a proppant to keep the fractures in the rock open, thus enabling the gas to flow into the casing and then to the surface. Chemicals are added to the fluid to perform such functions as reducing friction and inhibiting corrosion. After the "frack," oil or gas is extracted and 30–70% of the frack fluid, i.e. the mixture of water, chemicals, sand, etc., flows back to the surface. Many gas-bearing formations also contain water, which will flow up the wellbore to the surface along with the gas, in both hydraulically fractured and non-hydraulically fractured wells. This produced water often has a high content of salt and other dissolved minerals that occur in the formation. The volume of water used to hydraulically fracture wells varies according to the hydraulic fracturing technique. In the United States, the average volume of water used per hydraulic fracture has been reported as nearly 7,375 gallons for vertical oil and gas wells prior to 1953, nearly 197,000 gallons for vertical oil and gas wells between 2000-2010, and nearly 3 million gallons for horizontal gas wells between 2000-2010. Determining which fracking technique is appropriate for well productivity depends largely on the properties of the reservoir rock from which to extract oil or gas. If the rock is characterized by low-permeability — which refers to its ability to let substances, i.e. gas, pass through it, then the rock may be considered a source of tight gas. Fracking for shale gas, which is currently also known as a source of unconventional gas, involves drilling a borehole vertically until it reaches a lateral shale rock formation, at which point the drill turns to follow the rock for hundreds or thousands of feet horizontally. In contrast, conventional oil and gas sources are characterized by higher rock permeability, which naturally enables the flow of oil or gas into the wellbore with less intensive hydraulic fracturing techniques than the production of tight gas has required. The decades in development of drilling technology for conventional and unconventional oil and gas production has not only improved access to natural gas in low-permeability reservoir rocks, but also posed significant adverse impacts on environmental and public health. The US EPA has acknowledged that toxic, carcinogenic chemicals, i.e. benzene and ethylbenzene, have been used as gelling agents in water and chemical mixtures for high volume horizontal fracturing (HVHF). Following the hydraulic fracture in HVHF, the water, chemicals, and frack fluid that return to the well's surface, called flowback or produced water, may contain radioactive materials, heavy metals, natural salts, and hydrocarbons which exist naturally in shale rock formations. Fracking chemicals, radioactive materials, heavy metals, and salts that are removed from the HVHF well by well operators are so difficult to remove from the water they're mixed with, and would so heavily pollute the water cycle, that most of the flowback is either recycled into other fracking operations or injected into deep underground wells, eliminating the water that HVHF required from the hydrologic cycle. In order to assist in detecting leaks, an odorizer is added to the otherwise colorless and almost odorless gas used by consumers. The odor has been compared to the smell of rotten eggs, due to the added tert-Butylthiol (t-butyl mercaptan). Sometimes a related compound, thiophane, may be used in the mixture. Situations in which an odorant that is added to natural gas can be detected by analytical instrumentation, but cannot be properly detected by an observer with a normal sense of smell, have occurred in the natural gas industry. This is caused by odor masking, when one odorant overpowers the sensation of another. As of 2011, the industry is conducting research on the causes of odor masking. Natural gas heating systems may cause carbon monoxide poisoning if unvented or poorly vented. In 2011, natural gas furnaces, space heaters, water heaters and stoves were blamed for 11 carbon monoxide deaths in the US. Another 22 deaths were attributed to appliances running on liquified petroleum gas, and 17 deaths on gas of unspecified type. Improvements in natural gas furnace designs have greatly reduced CO poisoning concerns. Detectors are also available that warn of carbon monoxide and/or explosive gas (methane, propane, etc.). Natural gas prices at the Henry Hub in US dollars per million BTUs ($/mmbtu). Quantities of natural gas are measured in normal cubic meters (cubic meter of gas at "normal" temperature 0 °C (32 °F) and pressure 101.325 kPa (14.6959 psi)) or standard cubic feet (cubic foot of gas at "standard" temperature 60.0 °F (15.6 °C) and pressure 14.73 psi (101.6 kPa)), one cubic meter ≈ 35.3147 cu ft. The gross heat of combustion of commercial quality natural gas is around 39 MJ/m3 (0.31 kWh/cu ft), but this can vary by several percent. This is about 49 MJ/kg (6.2 kWh/lb) (assuming a density of 0.8 kg/m3 (0.05 lb/cu ft), an approximate value). Gas prices for end users vary greatly across the EU. A single European energy market, one of the key objectives of the EU, should level the prices of gas in all EU member states. Moreover, it would help to resolve supply and global warming issues, as well as strengthen relations with other Mediterranean countries and foster investments in the region. In US units, one standard cubic foot (28 L) of natural gas produces around 1,028 British thermal units (1,085 kJ). The actual heating value when the water formed does not condense is the net heat of combustion and can be as much as 10% less. The price of natural gas varies greatly depending on location and type of consumer. In 2007, a price of $7 per 1000 cubic feet ($0.25/m3) was typical in the United States. The typical caloric value of natural gas is roughly 1,000 BTU per cubic foot, depending on gas composition. This corresponds to around $7 per million BTU or around $7 per gigajoule (GJ). In April 2008, the wholesale price was $10 per 1000 cubic feet ($10/MMBTU). The residential price varies from 50% to 300% more than the wholesale price. At the end of 2007, this was $12–$16 per 1000 cubic feet ($0.42–$0.57/m3). Natural gas in the United States is traded as a futures contract on the New York Mercantile Exchange. Each contract is for 10,000 MMBTU or 10 billion BTU (10,551 GJ). Thus, if the price of gas is $10/MMBTU on the NYMEX, the contract is worth $100,000. Canada uses metric measure for internal trade of petrochemical products. Consequently, natural gas is sold by the gigajoule (GJ), cubic meter (m3) or thousand cubic meters (E3m3). Distribution infrastructure and meters almost always meter volume (cubic foot or cubic meter). Some jurisdictions, such as Saskatchewan, sell gas by volume only. Other jurisdictions, such as Alberta, gas is sold by the energy content (GJ). In these areas, almost all meters for residential and small commercial customers measure volume (m3 or ft3), and billing statements include a multiplier to convert the volume to energy content of the local gas supply. A gigajoule (GJ) is a measure approximately equal to half a barrel (250 lbs) of oil, or 1 million BTUs, or 1,000 cu ft or 28 m3 of gas. The energy content of gas supply in Canada can vary from 37 to 43 MJ/m3 (990 to 1,150 BTU/cu ft) depending on gas supply and processing between the wellhead and the customer. In the rest of the world, natural gas is sold in gigajoule retail units. LNG (liquefied natural gas) and LPG (liquefied petroleum gas) are traded in metric tonnes (1,000 kg) or MMBTU as spot deliveries. Long term natural gas distribution contracts are signed in cubic meters, and LNG contracts are in metric tonnes. The LNG and LPG is transported by specialized transport ships, as the gas is liquified at cryogenic temperatures. The specification of each LNG/LPG cargo will usually contain the energy content, but this information is in general not available to the public. In the Russian Federation, Gazprom sold approximately 250 billion cubic meters (8.8 trillion cubic feet) of natural gas in 2008. In 2013 they produced 487.4 billion cubic meters (17.21 trillion cubic feet) of natural and associated gas. Gazprom supplied Europe with 161.5 billion cubic meters (5.70 trillion cubic feet) of gas in 2013. In August 2015, possibly the largest natural gas discovery in history was made and notified by an Italian gas company ENI. The energy company indicated that it has unearthed a "supergiant" gas field in the Mediterranean Sea covering about 40 square miles (100 km2). It was also reported that the gas field could hold a potential 30 trillion cubic feet (850 billion cubic meters) of natural gas. ENI said that the energy is about5.5 billion barrels of oil equivalent [BOE] (3.4×1010 GJ). The field was found in the deep waters off the northern coast of Egypt and ENI claims that it will be the largest ever in the Mediterranean and even the world. Research conducted by the World Pensions Council (WPC) suggests that large US and Canadian pension funds and Asian and MENA area SWF investors have become particularly active in the fields of natural gas and natural gas infrastructure, a trend started in 2005 by the formation of Scotia Gas Networks in the UK by OMERS and Ontario Teachers' Pension Plan. Another way to store natural gas is adsorbing it to the porous solids called sorbents. The best condition for methane storage is at room temperature and atmospheric pressure. The used pressure can be up to 4 MPa (about 40 times atmospheric pressure) for having more storage capacity. The most common sorbent used for ANG is activated carbon (AC). Three main types of activated carbons for ANG are: Activated Carbon Fiber (ACF), Powdered Activated Carbon (PAC), activated carbon monolith. ↑ "Natural Gas – Exports". The World Factbook. Central Intelligence Agency. Retrieved 11 June 2015. ↑ "Background". Naturalgas.org. Archived from the original on 9 July 2014. Retrieved 14 July 2012. 1 2 "Electricity from Natural Gas". Archived from the original on 6 June 2014. Retrieved 10 November 2013. ↑ "Organic Origins of Petroleum". US Geological Survey. Archived from the original on 27 May 2010. ↑ "Natural Gas Explained". U.S. Energy Information Administration (eia). ↑ "World Bank, GGFR Partners Unlock Value of Wasted Gas". World Bank Group. 14 December 2009. Retrieved 17 March 2010. ↑ "History". NaturalGas.org. Retrieved 1 December 2016. ↑ Abbott, Malcolm (2016). The Economics of the Gas Supply Industry. Routledge. p. 185. ISBN 978-1138998797. ↑ Abbott, Malcolm (2016). The Economics of the Gas Supply Industry. Routledge. p. 185. 1 2 "World Energy Outlook 2009" (PDF). International Energy Agency. 2009. ↑ "Introduction to STG+ Technology". Primus Green Energy. February 2013. Retrieved 5 March 2013. ↑ "First cargo of Pearl GTL products ship from Qatar". Shell Global. 13 June 2011. Retrieved 19 November 2017. ↑ "Extraction". NaturalGas.org. Archived from the original on 8 July 2013. ↑ "Natural gas overview". Naturalgas.org. Archived from the original on 1 January 2011. Retrieved 6 February 2011. ↑ "Natural Gas – Proved Reserves". The World Factbook. Central Intelligence Agency. Retrieved 1 December 2013. ↑ US Energy Information Administration, International statistics, accessed 1 Dec. 2013. ↑ "Table 3.2 — World Proven Natural Gas Reserves by Country". OPEC. Retrieved 1 Dec 2013. ↑ "BP Statistical Review of World Energy June 2013" (PDF). BP. Archived from the original (PDF) on 4 December 2013. ↑ Helen Knight (12 June 2010). "Wonderfuel: Welcome to the age of unconventional gas". New Scientist. pp. 44–47. ↑ Michael Kanellos (9 June 2011). "In Natural Gas, U.S. Will Move From Abundance to Imports". Greentech Media. ↑ Mouawad, Jad (17 June 2009). "Estimate places natural gas reserves 35% higher". New York Times. Retrieved 25 October 2009. ↑ Morris Beschloss (2 September 2014). "U.S. Now World's Leading Natural Gas Producer". Desert Sun. Retrieved 4 November 2014. ↑ "Poland Seeks to Boost Shale Gas Industry". Financial Times. 2012. Retrieved 2012-10-18. ↑ Catherine T. Yang (9 August 2012). "China Drills Into Shale Gas, Targeting Huge Reserves Amid Challenges". National Geographic. Retrieved 2012-10-18. ↑ Franz Wild; Andres R. Martinez (7 September 2012). "South Africa Allows Exploration of Shale Gas Resources". Bloomberg. Retrieved 2012-10-18. ↑ David Schmidt. "Anaerobic Digestion Overview" (PDF). University of Minnesota. Retrieved 2017-11-19. ↑ "Interstate Natural Gas—Quality Specifications & Interchangeability" (PDF). Archived from the original (PDF) on 12 August 2011. Retrieved 6 February 2011. ↑ "Hyperion Treatment Plant". LA Sewers. Archived from the original on 2011-10-12. Retrieved 2011-02-06. ↑ "New York City's Wastewater Treatment System" (PDF). New York City Department of Environmental Protection. Retrieved 2011-02-06. ↑ "Bakersfield Wastewater Treatment Plant 3". Parsons. 2009-12-05. Archived from the original on 2011-01-21. Retrieved 2011-02-06. ↑ Steve Hargreaves (9 March 2010). "Natural gas crystals: Energy under the sea". CNN Money. Retrieved 6 February 2011. ↑ Tabuchi, Hiroko (12 March 2013). "An Energy Coup for Japan: 'Flammable Ice'". The New York Times. 1 2 "Processing Natural Gas". NaturalGas.org. Archived from the original on 1 January 2011. Retrieved 6 February 2011. ↑ "Natural Gas Processing: The Crucial Link Between Natural Gas Production and Its Transportation to Market" (PDF). Energy Information Administration, Office of Oil and Gas. January 2006. Retrieved 24 November 2017 – via The Louisiana Department of Natural Resources. ↑ "Natural Gas Processing". Axens. Retrieved 24 November 2017. ↑ Arg, S. R.; Engel, D. C. (1 January 2012). "Reliable & Efficient Feed Gas Preparation - A Key Enabler to Pearl GTL". OnePetro. Society of Petroleum Engineers. doi:10.2118/157375-MS. Retrieved 11 June 2015. ↑ Elliot, Doug; et al. (2005). Benefits of Integrating NGL Extraction and LNG Liquefaction (PDF). Prepared for Presentation at AIChE 2005 Spring National Meeting 5th Topical Conference on Natural Gas Utilization (TI) Session 16c – Gas. Archived from the original (PDF) on 26 June 2013. ↑ Seppo Korpela (21 July 2007). "Oil and natural gas depletion and our future". Resilience. ↑ "U.S. Natural Gas Gross Withdrawals". U.S. Energy Information Administration (eia). ↑ "Gas Infrastructure Europe". Energia Mexicana (in Spanish). Retrieved 18 June 2009. ↑ Ulvestad, Marte; Overland, Indra (2012). "Natural gas and CO2 price variation: Impact on the relative cost-efficiency of LNG and pipelines". "International Journal of Environmental Studies". 69 (3): 407–426. ↑ Hyne, Norman J. (1991). Dictionary of Petroleum Exploration, Drilling & Production. PennWell Books. p. 190. ISBN 0-87814-352-1. ↑ Arezki, Rabah; Fetzer, Thiemo (January 2016). "On the Comparative Advantage of U.S. Manufacturing: Evidence from the Shale Gas Revolution" (PDF). Journal of International Economics. Centre for Economic Performance. ISSN 2042-2695. Archived from the original (PDF) on 2016-07-01. ↑ "Bank-Led Satellite Imagery Sheds More Light on Gas Flaring Pollution". The World Bank — News & Broadcast. 29 August 2007. Retrieved 24 November 2017. ↑ Ethan (9 November 2007). "Will eyes in the sky end natural gas flaring?". Ethan Zuckerman’s online home. Retrieved 24 November 2017. 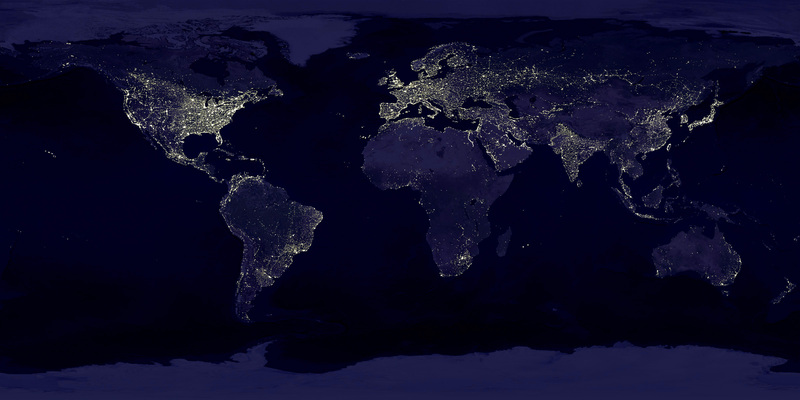 ↑ "Composite image of the earth at night". Retrieved 24 November 2017 – via Ethan Zuckerman’s online home. ↑ Jürgen Wagner (19 June 2007). "The Contours of the New Cold War". IMI. Retrieved 6 February 2011. ↑ "Gazprom and Russian Foreign Policy". NPR. Retrieved 24 November 2017. ↑ Sumit Roy (23 June 2014). "U.S. Natural Gas Export Era Begins In 2015, Fueling Upside In Prices". Seeking Alpha. Retrieved 11 June 2015. ↑ "SEAAOC - NT Resources Week - Informa - NT Government". NTRW. Archived from the original on 25 March 2012. Retrieved 11 June 2015. ↑ "The Floating Liquefied Natural Gas (FLNG) Market 2011-2021". visiongain. 28 January 2011. ENE8974. Retrieved 11 June 2015. ↑ "Petronas' FLNG Facility to Deliver First Cargo in Q1 2016". World Maritime News Staff. 22 April 2015. Retrieved 23 November 2017. ↑ Raj, Audrey (16 June 2015). "Steel cut for PETRONAS FLNG 2". Asian Oil & Gas. Retrieved 23 November 2017. ↑ "Browse Development — We remain committed to the earliest commercial development of the world-class Browse resources". www.woodside.com.au. Woodside continues to target the selection of a Browse development concept in H2 2017 and commencement of front-end engineering and design (FEED) in 2019. 1 2 "Natural Gas Fuel Conditioning System - BTU Reduction". American Environmental Fabrication & Supply, LLC. Retrieved 23 November 2017. ↑ Matthew L. Wald (10 April 2013). "New Solar Process Gets More Out of Natural Gas". New York Times. 1 2 3 4 5 "Natural Gas and the Environment". NaturalGas.org. Archived from the original on 3 May 2009. Retrieved 11 June 2013. ↑ "World Carbon Dioxide Emissions from the Use of Fossil Fuels". U.S. Energy Information Administration (eia). Archived from the original on 23 May 2011. Retrieved 5 February 2016. ↑ "How much carbon dioxide is produced when different fuels are burned?". U.S. Energy Information Administration (eia). ↑ Nuwer, Rachel (17 August 2012). "A 20–Year Low in U.S. Carbon Emissions". New York Times. ↑ "Biomass drying from CHP heat recovery". Alfagy Limited. Retrieved 2012-11-02. ↑ "2014 data?" (PDF). International Energy Agency. p. 24. Archived from the original (PDF) on 5 May 2015. ↑ Zimmerman, Barry E.; Zimmerman, David J. (1995). Nature's Curiosity Shop. Lincolnwood (Chicago), IL: Contemporary books. p. 28. ISBN 978-0-8092-3656-5. 1 2 3 Mulvaney, Dustin (2011). Green Energy: An A-to-Z Guide. SAGE. p. 301. ISBN 9781412996778. ↑ "Worldwide NGV statistics". NGV journal. Archived from the original on 2015-02-06. Retrieved 2017-11-19. ↑ "Clean Engine Vehicle". ETH Zurich. 22 October 2010. Archived from the original on 2015-01-24. Retrieved 2015-01-23. ↑ "Take a look at some natural gas-powered airplanes". Well Said. 6 November 2014. ↑ Jason Paur (31 July 2013). "American Firm Debuts First Airplane to Run on Natural Gas". Wired. ↑ Le Cheylard France (19 February 2014). "Chomarat Present C-Ply KittyHawk with CNG Potential". NGV Global News. ↑ "Development of Cryogenic Fuel Aircraft". Tupolev. Archived from the original on 9 December 2010. Retrieved 6 February 2011. ↑ "BioProtein Production" (PDF). Retrieved 31 January 2018. ↑ "Food made from natural gas will soon feed farm animals – and us". Retrieved 31 January 2018. ↑ "New venture selects Cargill's Tennessee site to produce Calysta FeedKind® Protein". Retrieved 31 January 2018. ↑ Le Page, Michael (2016-11-10). "Food made from natural gas will soon feed farm animals – and us". New Scientist. Retrieved 2016-12-13. ↑ Stanley Manahan (2010). Environmental Chemistry (9th ed.). CRC press. ISBN 978-1-4200-5920-5. ↑ Gavin Schmidt (September 2004). "Methane: A Scientific Journey from Obscurity to Climate Super-Stardom". National Aeronautics and Space Administration. Goddard Institute for Space Studies. Retrieved 11 June 2013. 1 2 "Curbing Emissions by Sealing Gas Leaks". The NY Times. 14 October 2009. Retrieved 11 June 2013. ↑ "World Natural Gas Production". Wolfram Alpha. Retrieved 2011-02-06. ↑ "Climate Change — Climate Economics — International Analyses". U.S. Environmental Protection Agency. 28 June 2006. Archived from the original on 2 February 2011. Retrieved 6 February 2011. ↑ Howarth, Robert; Santoro, Renee; Ingraffea, Anthony (2011). "Methane and the greenhouse-gas footprint of natural gas from shale formations" (PDF). Climate Change. 106 (4): 679–690. doi:10.1007/s10584-011-0061-5. ISSN 1573-1480. Retrieved 23 November 2017. ↑ "Response to Howarth et al's Reply (February 29, 2012)" (PDF) (Press release). Cornell. Retrieved 22 November 2017. ↑ Paul Tullis (18 April 2012). "New EPA Rules Could Prevent 'Fracking' Backlash". Bloomberg Business Week. Retrieved 11 June 2013. ↑ "Methane leaks from three large U.S. natural gas fields in line with federal estimates". NOAA. 18 February 2015. 1 2 Mikkal Herberg. "Natural Gas in Asia: History and Prospects" (PDF). The National Bureau of Asian Research. (written for 2011 Pacific Energy Summit). ↑ "Gas vs Coal". global greenhouse warming. Retrieved 6 February 2011. ↑ "Naturally Occurring Radioactive Materials (NORM)". World Nuclear Association. December 2016. Retrieved 22 November 2017. ↑ Chiras, Daniel (2012). Environmental Science. Jones & Bartlett Learning. p. 283. ISBN 1-44961-486-8 – via Google Books. However, natural gas extraction can cause subsidence in the vicinity of the well. One notable example is in the Los Angeles-Long Beach harbor area, where extensive oil and gas extraction began in 1928 and has caused the ground to drop 9 meters (30 feet) in some areas. ↑ National Petroleum Council (September 2011). Prudent Development: Realizing the Potential of North America's Abundant Natural Gas and Oil Resources (Report). Retrieved 24 November 2017. Lay summary (PDF). ↑ Brantley, Susan L.; Meyendorff, Anna (13 March 2013). "The Facts on Fracking". New York Times. ↑ Fitzgerald, Timothy. "Frackonomics: Some Economics of Hydraulic Fracturing." Case Western Reserve Law Review 63.4 (2013). Web. 1 Sept. 2015. ↑ Chojna, J., Losoncz, M., & Suni, P. (2013, November). Shale Energy Shapes Global Energy Markets. National Institute Economic Review. ↑ Yeboah, N.N.N. ; Burns, S. E. (2011). "Geological Disposal of Energy-Related Waste". KSCE Journal of Civil Engineering. 15 (4): 701–02. ↑ Gallegos, Tanya J.; Varela, Brian A. (2015). Trends in Hydraulic Fracturing Distributions and Treatment Fluids, Additives, Proppants, and Water Volumes Applied to Wells Drilled in the United States through 1947 through 2010—Data Analysis and Comparison to the Literature (PDF) (Report). 11. U.S. Geological Survey. Scientific Investigations Report 2014.5131. ↑ "Our responsibility: Limit the impact of our industrial operations". Total.com. Total. ↑ "Shale Gas and Other Unconventional Sources of Natural Gas". Union of Concerned Scientists. ↑ "How is Shale Gas Produced?" (PDF). Energy.gov. ↑ "U.S. Average Depth of Natural Gas Developmental Wells Drilled". U.S. Energy Information Administration (eia). ↑ "The Environmental and Occupational Health Impacts of High-Volume Hydraulic Fracturing of Unconventional Gas Reserves". APHA. 30 October 2012. ↑ "Documents Reveal Billions of Gallons of Oil Industry Wastewater Illegally Injected Into Central California Aquifers". Center for Biological Diversity. 6 October 2014. ↑ Keranen, K. M.; Weingarten, M.; Abers, G. A.; Bekins, B. A.; Ge, S. (25 July 2014). "Sharp increase in central Oklahoma seismicity since 2008 induced by massive wastewater injection". Science. 345 (6195): 448–451. doi:10.1126/science.1255802. PMID 24993347. ↑ Kelly, Sharon (6 August 2015). "Key Greenhouse Gas Study May Have Systematically Understated Methane Leaks". AlterNet. ↑ Osborn, Stephen G.; Vengosh, Avner; Warner, Nathaniel R.; Jackson, Robert B. (17 May 2011). "Methane contamination of drinking water accompanying gas-well drilling and hydraulic fracturing". Proceedings of the National Academy of Sciences. 108 (20): 8172–8176. doi:10.1073/pnas.1100682108. PMC 3100993. PMID 21555547. ↑ "Quality Assurance Project Plan For The Chemical Characterization Of Select Constituents Relevant to Hydraulic Fracturing" (PDF). U.S. Environmental Protection Agency. 18 October 2012. Retrieved 22 November 2017. ↑ Howarth, Robert W. (15 September 2011). "Should Fracking Stop?". Nature. 477: 271–275. doi:10.1038/477271a. ↑ Josh Harkinson (1 September 2011). "As Texas Withers, Gas Industry Guzzles". Mother Jones. Retrieved 22 November 2017. ↑ Rawson, Nancy; Quraishi, Ali; Bruno, Thomas J. "Findings and Recommendations From the Joint NIST—AGA Workshop on Odor Masking" (PDF). Journal of Research of the National Institute of Standards and Technology. 116 (6): 839–848. doi:10.6028/jres.116.026. ↑ US Consumer Product Safety Commission, Non-Fire Carbon Monoxide Deaths, 2011 Annual Estimate, September 2014. ↑ "Gas Density, Molecular Weight and Density" (PDF). teknopoli. ↑ "Energy Prices Report". Europe's Energy Portal. Retrieved 11 June 2015. ↑ "Market analysis". European Commission. Retrieved 11 June 2015. ↑ Farah, Paolo Davide (2015). "Offshore Natural Gas Resources in the Eastern Mediterranean in the Relations to the European Union: A Legal Perspective through the Lenses of MedReg". Journal of World Energy Law and Business. 8 (8). SSRN 2695964. ↑ James L. Williams (1998-10-02). "NYMEX Natural Gas Futures". WTRG Economics . Retrieved 2017-11-22. ↑ "U.S. Natural Gas Prices". U.S. Energy Information Agency. Retrieved 2012-08-21. ↑ Goldman, David (30 August 2015). "Natural gas discovery could be largest ever". CNN Money. ↑ "Adsorbed Natural Gas". scopeWe - a Virtual Engineer. Retrieved 11 June 2015.